Cauliflower is in season right now and one can see piles of cauliflowers on the road side hawkers selling these. It’s such a beautiful sight seeing those huge flowers, all white and green, piled on each other. It literally begs to be bought. Many a time I think I should carry my camera just to capture the scene but fail to do that. When I decided to make Bihari dishes, I checked if they have a gobi recipe listed. 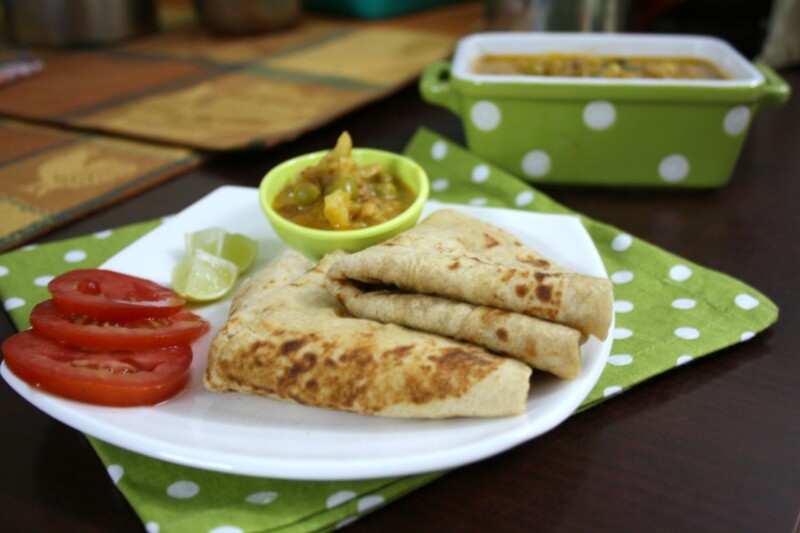 Though there were other recipes, none that suited me for making for lunch or for rotis. Then I came across this Aaloo Matar that I wanted to make and decided to replace the aloo with gobi, so we ended with Gobi matar. Wash and soak cauliflower in hot water for 10 mins. Add bay leaf and onion. Fry till onion turns colour. Next add tomatoes, ginger-garlic paste, drained cauliflower and peas. Saute well. Add turmeric, salt, garam masala, chilli powder and jeera powder. mix well everything well and continue cooking. Finally top with ghee and coriander leaves before serving. If you are running short of time, you can pressure cook the dish. Potatoes can be added along or just with matar. 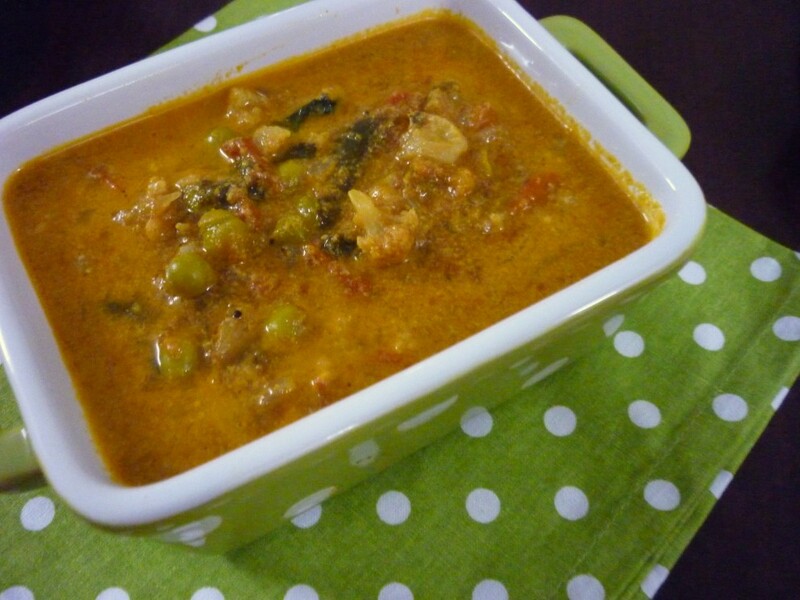 Delicious curry which goes very well with rotis,wonderful spread. Perfect side to rotis. Happy New Year Valli. Super delicious pair for rotis,do send them to CWS Valli..
Looks yummy 🙂 How do you get the gravy part? Do I have to add onion paste/tomato puree or anything else to make the gravy thick? Meera These days I tend to add almost grated onions so that it gives the gravy. Else if you want it little rich you can add cashew paste or even curds. 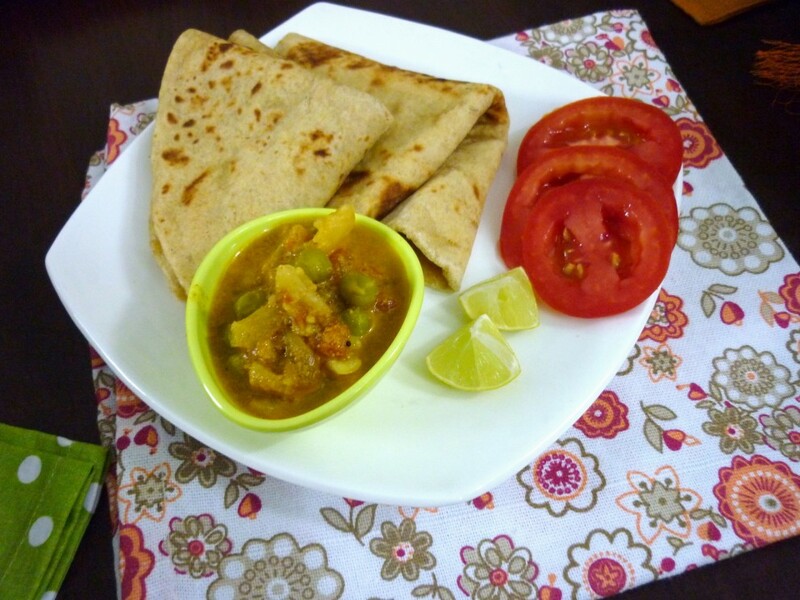 Perfect Combo with Hot Roti's!!!! You say "Ginger Garlic Paste – 3/4" by this 3/4 teaspoons or tablespoons. I'm writing from Scotland so to me knowledge I hadn't seen Ginger Garlic Paste for sale here so how would I make it. Great recipe but I just need this clarified. 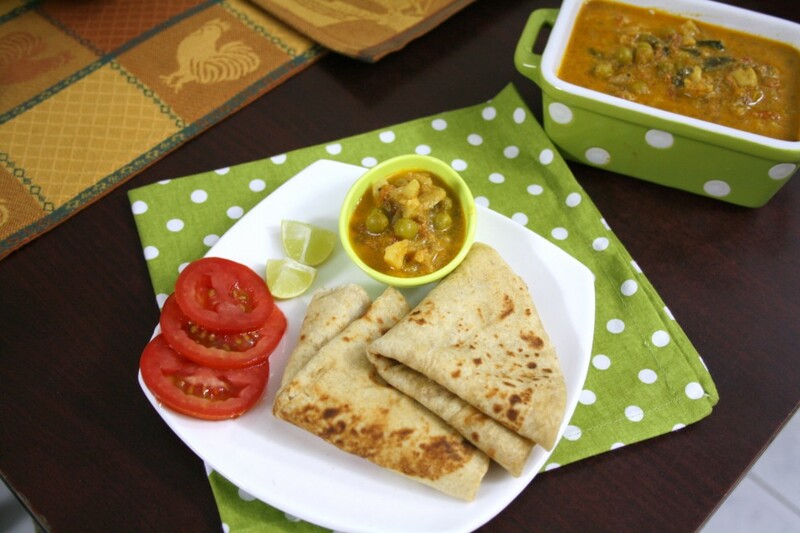 Lovely side-dish for Roti or Naan! Yummy sidedish and love your serving dish as well. curry looks very nice. Loved the polka dotted dish! !